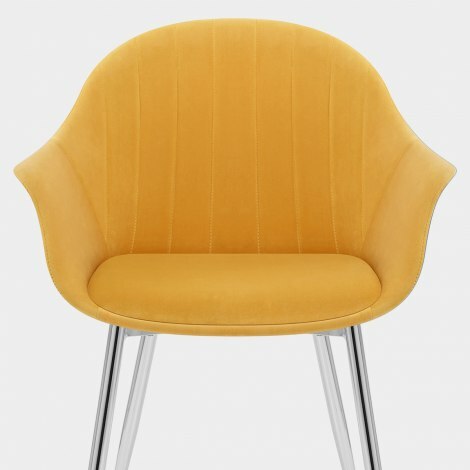 A bold and beautiful item, the Flare Dining Chair Mustard Velvet is a versatile design that is fashionable and functional in a host of settings. Exuding a sense of retro flair whilst maintaining modern appeal, the Flare is a gorgeous piece of furniture for the home. 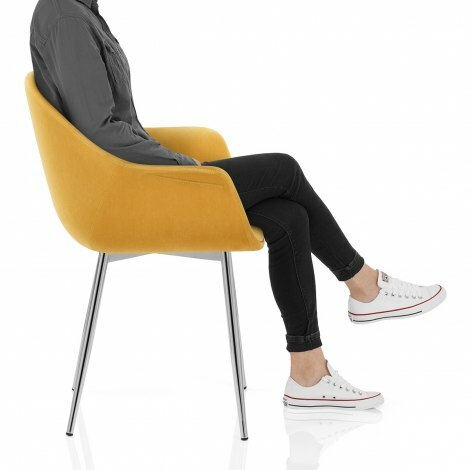 Stylishly clad in magnificent mustard velvet, the feature seat pad and ergonomic backrest are padded for great comfort. Inlaid with vertical stitching, the backrest also wraps around the seat and forms two flared armrests that add a sense of sophistication. Mirrored chrome legs support the seat and have a tapered design that is elegant and chic. As an additional practical feature, each leg is capped with protective pads to help take care of your floors.